A new approach makes fast, accurate reservoir modelling a practical component of field management. UpdateAbility™ speeds update by modularizing and automating common functions such as fault repair and truncation against surfaces. ©Fugro-Jason Drilling rates are at an unprecedented level, generating large volumes of data that, if modelled, could yield a greater understanding of the subsurface. This in turn could yield improved drilling programs and advanced warning of operational challenges. Yet until recently the techniques and technologies employed for geologic modelling have not been able to keep up with the quickening pace of new data acquisition. As a result, many fields are modelled infrequently and operational logistics tend to be driven by reactive rather than predictive decision-making. The objective in building and maintaining a reservoir model is, of course, to be able to predict the future performance of the field. By interpreting data from well logs, cores, seismic and other data, geologists, engineers and geophysicists can develop a better understanding of how the reservoir functions, and can simulate flows over time. An early model can help determine the initial drilling program. Ongoing models that take into account each drilling cycle can drive adjustments and tune operational logistics as the field matures. While most would agree with the concept, many have hesitated to adopt ongoing modelling because of two major operational constraints: First, substantial manual intervention in the model definition has been required to get flow simulations from the initial model to match production data, and second, updating the model with new wells or changes in the structural and stratigraphic definition has typically been extremely time-consuming. As a result, even in large fields operated by the top oil companies, modelling has often been infrequently applied. Some fields go as much as three years between modelling efforts. This choice, based on economic realities at the time, forces a reactive stance at the field level. When the unexpected is encountered, it is handled in the moment .As time goes by, the unexpected is compounded and the subsurface is more and more uncertain. A new approach now makes modelling and simulation a practical component of ongoing field management. It creates a highly detailed model that easily incorporates new operational data and can be updated anywhere in the workflow, from seismic to simulation. Its iterative workflow approach takes significantly less time, allowing operators to keep up with drilling schedules. Real-world use has shown a 3-5x speed up in modelling and maintenance tasks. This new approach automatically records the workflow and provides the framework for the model to be updated when any input is modified or any modelling parameter is changed. By taking advantage of this new approach, exploration and production managers can improve their drilling programs, production yield and predictive planning accuracy. 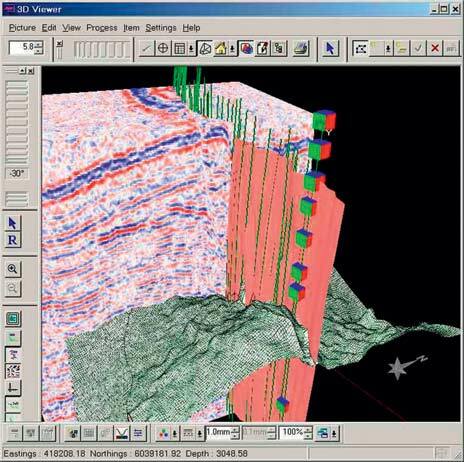 A solid model grid (SMG) can be quickly created through the rapid combination of geologic information and seismic data, then updated and upscaled for simulation if required. This seismic-to-reservoir model workflow can be modified and updated every time new information is available. Modelling begins with well logs, cores, a geologic interpretation, and other operational data. A geologic model is built from this data, based on a corner point grid (CPG). This model is then reviewed by geologists and engineers to ensure it matches conditions observed in the field. Seismic inversion creates a 3-D representation of the stratigraphy and lithology of the field, which is then combined with the geologic model to create a new model that honours all the data in the field. From here, engineers can upscale the model and run flow simulations when required or use the models for infill drilling techniques. This process is now far more integrated and substantially faster than ever before. 1. Updating the structure. When a geologist adds a structural feature, certain characteristics are implicit and automatic. For example, if a fault is added and it crosses a horizon, the fault horizon interface is automatically adjusted. This modularity removes much of the need for manual intervention. 2. Updating the data. New operational data can be added to the model at any time. The effect of the new data is essentially immediate because after adding the new data, the previously recorded workflow is rerun with the additional inputs. 3. Updating the recorded workflow. The geologist or engineer can revisit any decision or parameter in the workflow at any time. All changes are immediately reflected in the model. Significant time-savings enable geologists and engineers to run multiple scenarios and simulations, resulting in a more developed model in a fraction of the time. Three scenarios or more can now be routinely simulated in the time it takes with other approaches. A common complaint when modelling infrequently is that the realities in the field no longer match the predictions of the model. 1. Reservoir models must incorporate all field data as quickly as possible. In the past, models were not able to keep up with the volume or pace of data acquisition. Models and operations got out of sync. To be truly useful, models must be current. 2. 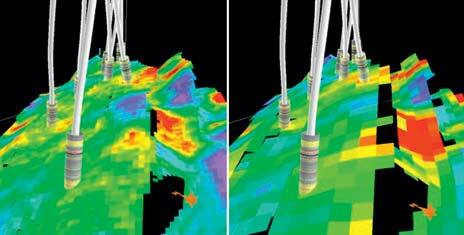 Modelling and simulation must become a regular component of field management. With the new approach, both of these changes can and should be made. Consider the case of a new fault discovery. This will likely have an effect on flow and may drive the need for an additional well. If the new condition could be quickly incorporated into the reservoir model, the operator could determine the best course of action to preserve or enhance the field production. Similarly, if the gas flow from a field is increasing, modelling can help predict the downstream facilities needs and timing. Preventing the drilling of one dry well through ongoing modelling saves a lot of money. Anticipating the needs of surface and downstream facilities can secure additional savings. Modelling is a critical component in answering such questions as: Are there ‘hidden' reservoirs that were missed, what impedes flow, what is the best way to leverage secondary recovery techniques, how can overall recovery be optimized, what downstream facilities will be needed in the next few years, what surface facilities will be needed to deal with extra water, higher gas mix, cutover to other wells, and other operational changes, is there a risk of ‘surprise wells'? Reservoir modelling and simulation is now a practical solution for addressing these questions on an on-going basis. Accurate models created and updated in a fraction of the time previously required can help improve operational logistics and overall field production.